This post is sponsored by House Foods. All opinions are my own. 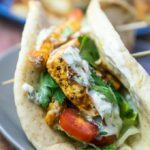 Stuff a warm pita bread with tender spiced tofu, lettuce, tomatoes, and vegan tzatziki to make these delicious grilled tofu gyros! I’ve always been of the opinion that there’s no reason for vegetarians to feel left out when it comes to grilling. The majority of plant-based foods taste delicious when grilled, and while it takes a little bit of finesse, grilled tofu is no exception. Here I’ve marinated it in a blend of Greek inspired seasonings and umami ingredients to make it worthy of your grill. 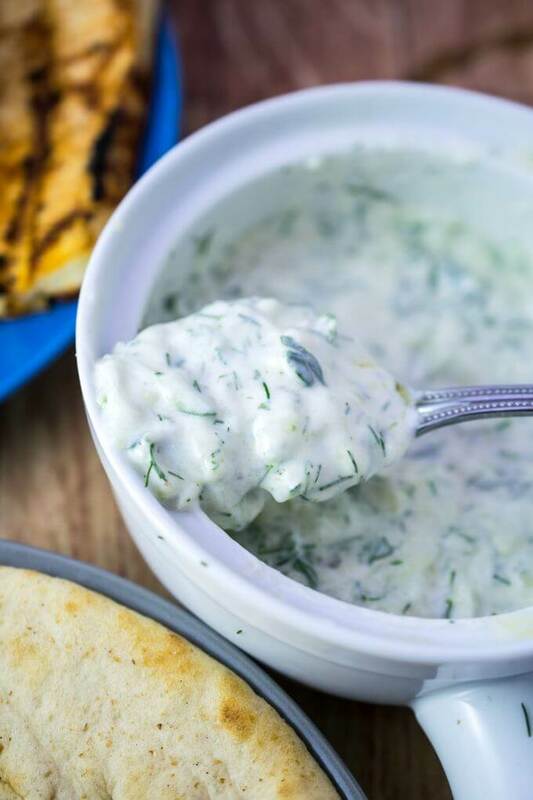 You can certainly use tahini sauce or hummus instead of vegan tzatziki, but I encourage whipping some up if you can access plain non-dairy yogurt. I tested this with both coconut yogurt (my fave) and almond yogurt (something I eat begrudgingly) and thanks to the punchy vinegar and dill flavors, it tastes great either way. I put some french fries in my tofu gyros because they’re sometimes included and I am a potato lover. Optional! Any grilled vegetables you happen to be cooking up would also be nice additions here. I rounded my pita bread out with lettuce, cherry tomatoes, some extra fresh parsley, and a few slivers of red onion. If you give this grilled tofu gyros a try, let me know! Making it is as simple as firing up the grill, picking up some pita bread and House Foods tofu at the grocery store, and whisking together a simple marinade. I hope you enjoy this gyros minus the meat! 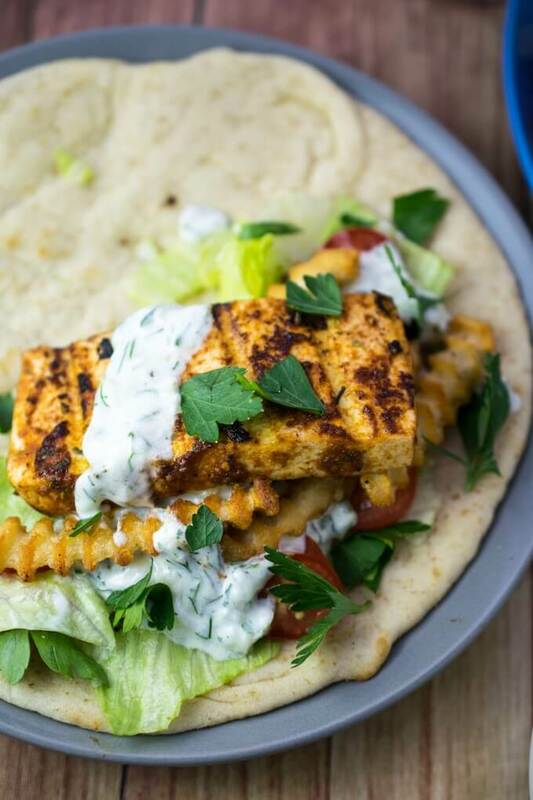 Tofu is dipped in a Greek-inspired savory marinade, grilled to perfection, and drizzled with dairy-free tzatziki to make these grilled tofu gyros. Sprinkle the shredded cucumber with salt and place it in a colander to drain for 10-15 minutes. Stir together the yogurt, oil, garlic, salt, and vinegar in a bowl. Take the cucumber and squeeze out any more excess liquid using your hands or cheesecloth. Stir it into the mixture until well-incorporated. Finally, stir in the fresh dill. Season to taste and store cold. Open the tofu, drain liquid from the package, and then wrap it in a clean towel, placing a heavy object on top of it to press out excess liquid from it. (Or use a tofu press). Let the tofu press for 10-15 minutes. Preheat your grilling implement and make sure the grates are cleaned and well-seasoned with oil. Mix together all of the ingredients for the tofu marinade until smooth. Cut the tofu width-wise into 8 approximately-equal slices. 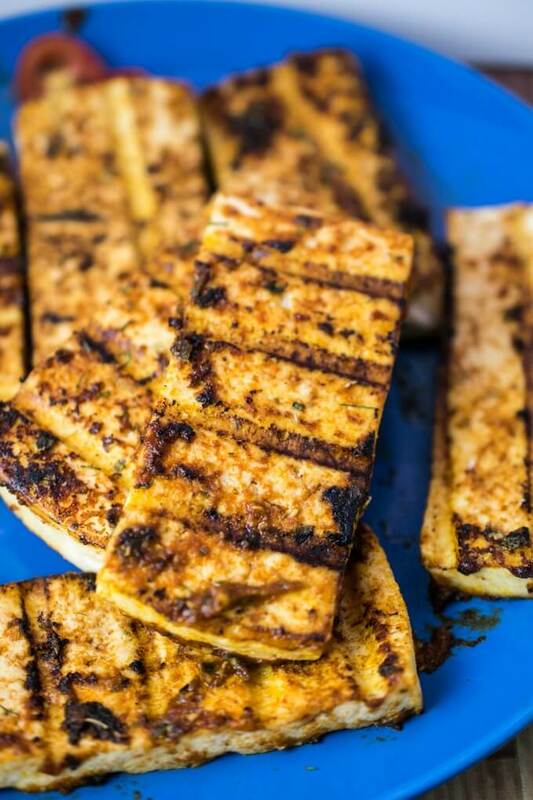 Use a baking dish or a large plate to pour the marinade over the tofu slices, then turn them over to coat both sides. Grill the tofu pieces on an outside edge of the grill (don't use the hottest part; low-and-slow helps make the tofu a little chewier and crispier). Cook for 6-8 minutes per side, flipping halfway through. You want to see the tofu getting a little bit crisp on the outside with nice browning. If desired, brush the tofu with a little bit more of the extra marinade after cooking. If desired, warm the pitas on the grill or however you prefer. 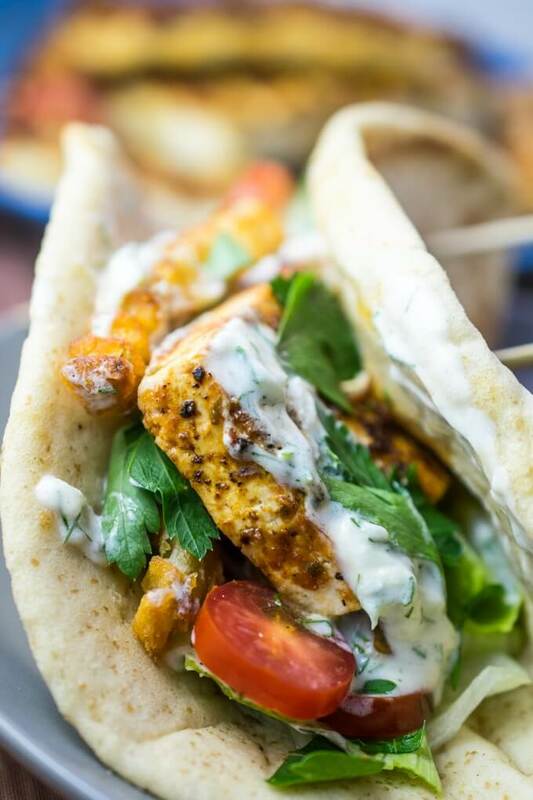 Add two slices of tofu to each pita, along with plenty of lettuce, tomato, tzatziki, French fries if using, and any other toppings of choice. Enjoy hot. Nutrition facts exclude French fries and assume only half of the sauce is used. I made this on Sunday night for some friends. One friend told me, “This is excellent! I don’t like tofu so I was really worried when you told me that’s what we were having.” Great food was had by all. I did cut the tofu into smaller portions and cooked in a skillet with hot oil as I didn’t want to get out the grill. This was really tasty. Thank you. This was absolutely amazing and makes me want to go back to Greece. As a college student living in a cramped space, I “grilled” the tofu on a George Forman Grill and it worked perfectly. I also used Silk (soy) plain yogurt and the tzatziki turned out great! Then I subbed Spinach for lettuce since that’s what I had in the fridge. I am storing the rest of the tofu and tzatziki in the fridge to eat for lunches this week. I just made the tofu part to go in some Greek salads. Yum! The tofu here is so versatile. Great recipe will be a favorite for us. This was fabulous! Even the non-vegetarians in the family enjoyed it. Paired it with Greek roasted potatoes. I will definitely make this again. I made these tonight and they were so good. I don’t have a grill so I just used a saucepan. Thank you for the recipe! Hugs! No prob Dayna, glad you enjoyed it – and thank you for sharing that your modification was successful! Forget the Vegan Yogurt for Tzatziki, get some Aquafaba, Lemon Juice and Dijon Mustard in a blender then drizzle with oil till it reaches the right consistency. Mix with Chopped Cucumber, Dill and Salt. Thanks for the suggestion Barry! I do love aquafaba based dressings and it sounds delish. The yogurt does have a special tanginess to it though – I’m sure both options are great with these vegan gyros. If you add potatoes, sprinkle them with some Oregano and Salt. They do them that way in Greece, good on their own too. These look super good. Making this for lunch one day this week. Thank you!